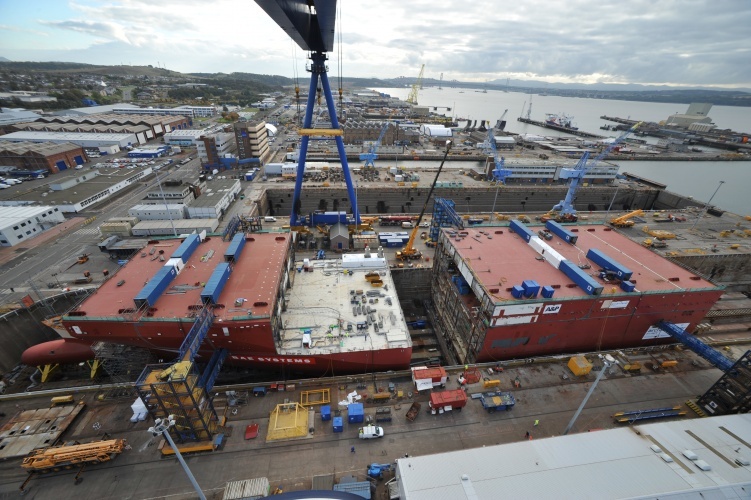 As we approach the end of the year it is quite interesting to look back at what has happened in the project to deliver the Queen Elizabeth Class Aircraft Carriers over the past 12 months. If 2011 was characterised by the building of large blocks at locations all around the country, 2012 was all about transporting the finished blocks to Rosyth and 2013 about assembling the blocks within the build dock. 2014 however was the year in which we moved from a construction project in the dock through to having a real ship afloat in the basin. The ugly duckling with all the parts at different levels of painting and surrounded by scaffolding transformed in the summer into a magnificent swan, unveiled to the world at the naming ceremony by the Queen on the 4th July. When I talk about what I do outside of work these days the response has changed from disbelief that the UK were still building aircraft carriers through to questions of when we will see these ships operating with their aircraft, and that day is coming ever nearer. When we are embroiled in the day to day activities and the addressing of the problems that occur along the way it is all too easy to lose sight of the amazing achievements of the roughly 10,000 people working within the Aircraft Carrier Alliance and the wider supply chain that has resulted in HMS Queen Elizabeth being named and floated up on the dates that were set back in 2008 when the Manufacturing Phase contract was signed. This has been a huge team effort and I hope that everyone who has had any involvement in the project feel the same sense of pride as I do in what has been achieved. At the start of the year the hull of HMS Queen Elizabeth was structurally complete, but there were still a number of catwalks, radars and masts to be installed, underwater there were tanks to be closed up overboard inlet and discharge piping to be made watertight and the installation of shafting and propellers to be completed. 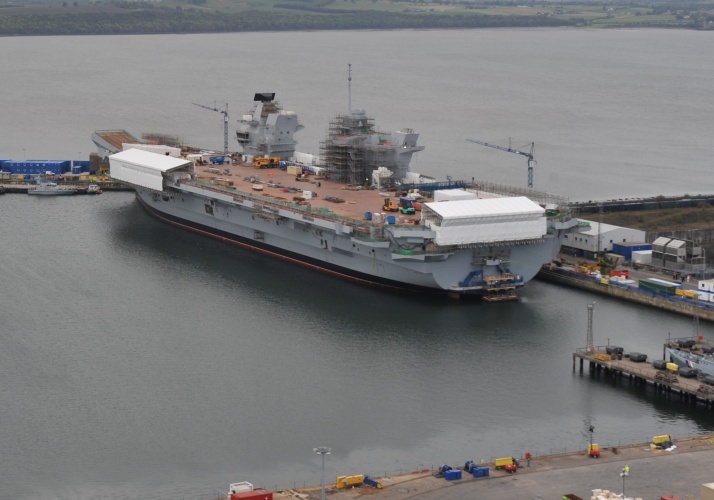 Many people thought that completing this work together with applying the 1.5million metres squared of paint in time for the naming ceremony and float out in July was a very tall order, but it was all achieved and on the 17th July HMS Queen Elizabeth was afloat and alongside her berth in the non-tidal basin at Rosyth. Since that time a lot more has occurred. 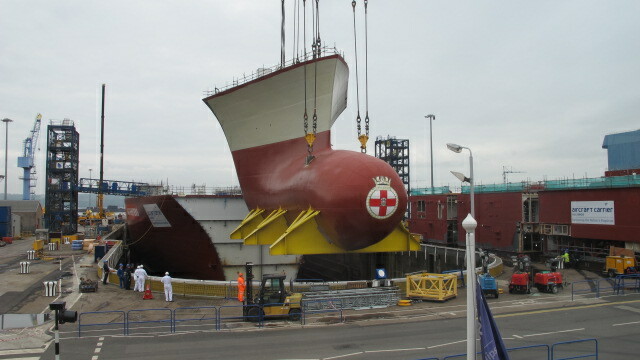 In September the build dock was empty while the dock blocks were refurbished, by October lower blocks 2 and 3 of HMS Prince of Wales were docked down, in November the two blocks were skidded together and now in December over 40% of the hull of Prince of Wales is assembled in the dock including upper blocks and the first sponson blocks. Preparation is underway to complete the painting of the forward tanks, an operation that occurred on Queen Elizabeth less than a year ago such is the learning that has been applied to the second ship. Much has continued to happen on Queen Elizabeth since she has been afloat. Over 10,000 electrical cable terminations are being made per week and about 1,000 pipes are being pressure tested each week. This has enabled the ship to be connected to the shore 11kV electrical supply and the High Voltage systems on board the ship energised. The Ship Control Centre(SCC) has been brought to life with Integrated Platform Management System (IPMS) software running on the ship’s computers and being used to control breakers in both the High Voltage and Low Voltage systems. The large screen displays in the SCC are fitted and will shortly be displaying IPMS data. The Operations Room is also progressing with the first of the Combat Management System computers now installed and with the network of fibre optics that make up the integrated network (through which all the ships data is shared around the ship) completed in the forward part of the ship. This Integrated Network Environment has been energised for the first time this month. Preparations are underway for the embarkation of fuel early in the New Year that will allow the ship’s diesel generators to be started and the ship to start to generate its own high voltage power, which will ultimately lead to the turning of the propeller shafts in mid-2015. Yes a great deal has been achieved through the year but there remains a great deal more to do in order to achieve our objective of First of Class Flying Trials off the east coast of the United States in 2018. A great achievement and effort indeed. It’s just a pity that the idiots in the MOD decide to have the carriers built in such away that they could only carry and operate VTOL and VSTOL aircraft. But there again the MOD and GOVERNMENT have been wearing blinkers for the last 40years. Nice to have the Carruers back again though. Just have to hope that the MOD can buy more than 4 F35B’s a year, at that rate both Carriers may just about have thei full complement at decommissioning time!!!! a great achievement indeed, i would have preferred cats and traps design flying british built aircraft but the last labour government had other ideas. The orders for the F35b’s currently are part of the LRIP – Low rate initial production run. The UK has ordered 8 aircraft to date which is second only to the USA in terms of numbers. Long lead items for another 9 aircraft are in place. Then a major order will be placed as production ramps up. As for the comment about cats and traps the current tory led government said they were going to change to this design before deciding the original STOVL plans were more suitable for UK needs. Despite the usual scaremongering in the national non-specialist media the F35 will be built in the thousands and Britain will share 15% of each aircraft made as the only level one partner of the program. How about: BAW (bribe and win), IATS (Ideas above their station) BBB (Bu***it baffles brains) IDMIOAB(it doesn’t matter, its on another budget) LZTB (lets zap those bastards) I could go on? What happens after the carriers are finished? lets look at the long term prospects of the yard. The large Goliath crane what happens with that? Actually, I missed the full implication of Steve Bell’s comment about ‘cats and traps’- catapults and trapping systems to arrest incoming aircraft?- on first reading. It was my privilege to add to the technology of those systems: reducing weight whilst increasing the strength of structures. BA also produce the ‘long-stop’ system (at the end of every RAF runway) there to ‘catch’ (think spiders) planes whose brakes and/or drogue-parachute have failed. These are needed perhaps only twice a year but save £millions ensuring un-damaged aircraft and crew! I gather they are carried on carriers. Fellow bloggers might recall that the school I attended had a single entry requirement. That one’s father-a past member of a charitable organisation- was dead. That is except the parent of one friend: who’s father had been amongst the flight-deck crew on a WWII carrier: which suffered an arrestor cable break…which on recoil removed both his legs! One of the modern ideas to absorb the substantial forces involved on carrier landings was to use the energy to complete the ‘draw’ of partially drawn ‘synthetic fibre’ webbings and braids. [Think pulling, in pubs/BBQs -come on we’ve all done it- of the plastic holders that retain the close location of six-packs of drinks] This is believed to be a much more controlled adsorption of energy (and putting less stress on the aircraft) than wires, hooks and hydraulic oil ‘pots’. Though perhaps the VTOL capability is safer? Now that the administration, management and technology of the yard has been seen to be capable of manufacturing outstanding vessels…surely the swords to plowshares switch is a given, crane or not! Come to think of it, if the carriers are to be almost empty of aircraft for much of their life: and the planes they will carry are to take-off and land on a sixpence…why do we not simply use a container ship with appropriate modules for specific roles. Heavens, civil engineers use ‘containers’ for their offices and oil-rigs use them for accommodation…so a score of these on a simple hull would surely suffice. Indeed, unless I am mistaken, one of the reasons for the carriers and the associated military capability/trained personnel etc (according to the PR blitzkrieg) is to have a facility to deal with natural disasters. Swords to plowshares yet again.